Why do Motorcycle Accidents Happen in Philadelphia? The past few weeks have seen numerous motorcycle accidents on the streets of Philadelphia, many of which have been fatal for the motorcyclist. In one accident, the driver of a car was pulling out of a parking lot and collided with a motorcycle, killing the motorcyclist. On September 5, another motorcyclist was killed in a three-vehicle crash in northeast Philly. And in the last motorcycle accident we’ll mention—also on September 5—a Wilmington woman turned left into oncoming traffic and collided with a motorcyclist on Philadelphia Pike. The motorcyclist was traveling southbound near Holly Oak Road when the woman turned directly in front of him. The motorcyclist was taken to the hospital in serious condition, and the woman was cited for turning left instead of yielding. Motorcycle accidents are often tragic because motorcyclists don’t have the protection car drivers do. Plus, Pennsylvania law doesn’t require motorcyclists to wear helmets if they’re over the age of 21 and have either two years of riding experience or have completed a motorcycle safety course. In many motorcycle accidents, the motorcyclist is killed, while the car driver doesn’t even suffer a scratch. Extra safety precautions often outweigh the fatal outcomes of a motorcycle crash. 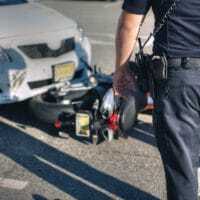 If you or a loved one has been injured or killed in a motorcycle accident, please contact Benedum Law in Chestnut Hill for a free consultation. Available to assist anyone in the Greater Philadelphia area, we’re available nights and weekends, and have the ability to travel to your location.